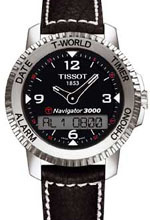 Description : Swiss Made quartz with analog and digital movement. Stainless steel casing. Water-resistant to 50m. Scratch-resistant sapphire crystal.